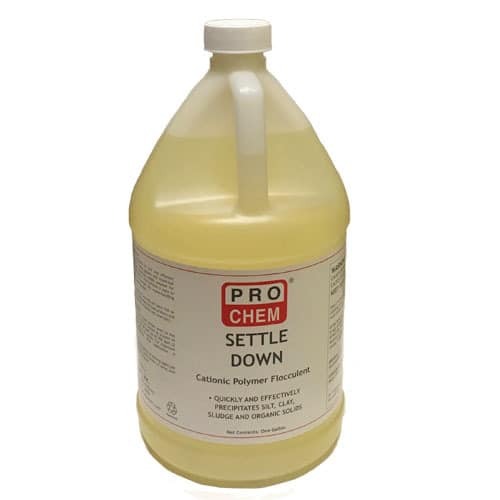 Settle Down | Pro Chem, Inc.
SETTLE DOWN is designed for fast and efficient clarification of wastewater. It is a cationic polymer flocking agent (or coagulant) that separates dirt and bacteria from clean water. When added to a wastewater tank, it works like a magnet, bonding with the sediment in the water and weighing it down. This causes all the dirt and bacteria to drop to the bottom. The water in the tank is now clean on top and ready to be passed on for further processing. The leftover sludge is removed from the tank and can either be disposed of in a landfill or used to make compost. Feed SETTLE DOWN directly into the waste stream prior to the clarifier or settling basin. Drip or pump into the system at a point of strong agitation. Use rates may vary from 50 ppm up to 300 ppm (2 quarts up to 3 gallons per 10,000 gallons of waste). For maximum economy and effectiveness, continuous drip application is recommended. For ponds or lagoons, drip or spray 10 to 20 gallons of SETTLE DOWN per million gallons of water. Drip directly into waste stream or spray over surface to obtain even distribution of the polymer.